There was always the risk that the subject of Win Win: a troubled teen and the family that takes him in, will become a maudlin, mushy effort. However, the people in front of and behind the camera make Win Win a true-to-life story that doesn't turn sentimental or saccharine-sweet but that takes the time to make the characters realistic, balancing comedy with drama. Mike Flaherty (Paul Giamatti) is a lawyer and volunteer wrestling coach who's hit hard times. Financially strapped, he finds that he can earn a little income by becoming the guardian of a senior, Leo (Burt Young). The deal is that in exchange for the monthly guardian fee, Leo can stay at his home rather than be put in a retirement home. Mike takes the money but dumps Leo at the home anyway. Mike's wife Jackie (Amy Ryan) is kept in the dark about both Leo and the Flaherty finances, with only Mike's friend Terry (Bobby Cannavale) aware of the subterfuge. Things are going well, until the sudden appearance of Leo's grandson Kyle (Alex Shaffer), son of Leo's estranged wife. With nowhere to put Kyle, Mike has no choice but to take him in. Fortunately for Mike, he discovers Kyle is a natural wrestler. Despite the misgivings of Mike's fellow coach Stephen (Jeffrey Tambor), he puts Ryan on the team and have wrestling enthusiast Terry as co-coach. Now things are starting to go well for both Mike and Kyle: the former now has a good wrestling team and a secret source of income, the latter (unaware that Leo should not be at the home), building a relationship with the grandfather he never knew and a stable home life. Then we get a twist: Kyle's mother Cindy (Melanie Lynskey) comes back. She wants to be Leo's guardian, and at first Mike appears to cleverly use the law to stop her, but then Mike's deception is exposed. Kyle isn't happy to see his drug-addicted mother potentially wreck both his and Leo's life, prompting him to escape. In the end, a deal is worked out, and it does become a Win Win situation for all. Again, all this could be hopelessly hokey. However, writer/director Tom McCarthy (with the story credited to McCarthy and Joe Tiboni) moves Win Win away from sentimentality by focusing on the characters rather than the story. Mike is shown not as greedy or heartless but as deeply flawed but basically a good man. We see this whenever we see him in a family setting; his relationship with Jackie, his own children and the wrestling students is real: loving but at times frustrated. We also see this with the character of Kyle. In most films that would copy Win Win's formula, Kyle would start to thaw around the family. It doesn't quite happen: while we do have a montage of Kyle behaving like a regular teen around his classmates and the Flaherty family, he doesn't move far from his soft monotone speech. Moreover, Kyle doesn't have a major meltdown involving tears or hugging. In fact, Kyle in Win Win remains what he is: a teen beaten up a lot by life but who is still basically a kid, who has a passion for wrestling because it's something he's both good at and in control of. This credit is due to the performances of all the cast. Giamatti specializes in schlubs facing great crises and here, his Mike is someone who we see made a series of bad decisions based on his needs. Rather than open up to Jackie about the financial straits he finds himself in, he makes a snap decision about Leo. When presented with the complication of Kyle, again, he makes a snap decision, but throughout Win Win we never see him as a bad man. We get to like Mike despite, or because of his flaws, and in the end we do cheer him on because not only do we see that his unethical choices have reaped positive results but because it is actually good for Kyle. The other great performance comes from Shaffer in his first role. The former school wrestler doesn't make Kyle the typical troubled teen: a kid who acts out to cover his yearning for love. Instead, Kyle as performed by Shaffer is a regular teen who hasn't been given stability until reaching the Flahertys who are by no means perfect. His directness and honesty show he is in many ways an innocent, a mixture of wisdom and youthful naivete. While Cannavale and Ryan have supporting roles, both of them are also great to see. Cannavale's Terry has his own issues: his now ex-wife has shacked up with the contractor he had hired, but in his passion and almost childlike enthusiasm for wrestling Cannavale shows a flair for comedy I may not have appreciated before. At times his story, which might make a film in itself, did appear to drop off once the Kyle story took center stage, but perhaps this is a slight misstep. Ryan as Jackie is not the silent wife: far from it. Throughout Win Win Jackie isn't ashamed to let Mike know what she thinks about letting Kyle into their house, then about Kyle's mother. Ryan never makes Jackie into some sort of shrew, but instead a woman who loves and can't imagine how anyone would behave the way they do. When she objects to Kyle's smoking, it isn't in a lecturing or mothering tone, but as one of a woman in charge. When she shows her displeasure at Cindy's behavior, it's as a mother who knows this is not how a parent should behave. 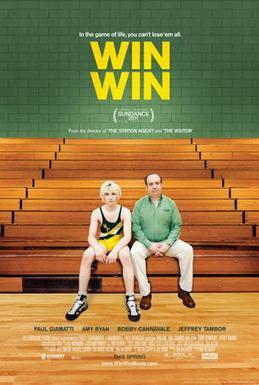 What we should remember about Win Win is that it is suppose to be a comedy, which is highlighted by Lyle Workman's score. A lot of comedy comes from the wrestling team: one particularly funny moment comes from when reluctant wrestler Stemler (David Thompson) finally faces his fear of actually wrestling only to be scared off by the opponent in what Stemler calls a 'Darth Vader' mask. However, even in the midst of comedy, we have such human and for lack of a better word, heartwarming and tender, moments. Kyle, who has made friends with Stemler, rallies him to face Darth Vader, and we feel for both of them. If any scene in Win Win sticks out to me as to how well McCarthy balanced humor and heart, it is when Kyle rejects Mike for both deceiving Leo and having Cindy pop back in his life. When the Flahertys walk away, Jackie turns and says, "Just so that you know, I love you". In any other film this would have been built up to a big moment: swelling music, hugs, tears. Here, she says it as a statement of fact, as if she has to tell him what she feels not for Kyle's own sake but for her own, almost to make it clear to Kyle that his decisions will affect more than just him. The fact that she said it directly, almost snapping at him, brings out the best in Win Win: a film that doesn't shy away from having flawed characters live as realistically as possible. The film allows the characters to behave as people we might know, and with the film having such real characters makes Win Win a strong film. We have a comedy where the people are flawed, the resolutions are natural without being forced, and characters we all care about. The performances are sharp, funny, and touching. Win Win is most accurate in its description.